I really can't believe that it's already August! Have a ton to do! Yesterday I spent the entire day cleaning poor Tinker House! I had really made a mess in there and didn't realize how bad it had gotten until I had guests this weekend and really looked at it! I thought I would show you around and answer some of your emails about Tinker house. Tinker House is constructed of reclaimed doors, windows, millwork and other trim items, Most of which came from our own homes renovation. The only new parts are the four 4x4x12 posts that are cemented in the ground on all four corners and the banding board that holds them together. Everything else (except for the screws :) Are reclaimed! It's much more than that...it's my sanctuary. Well, most of them anyway. And to tinker around with a few projects. The floor of Tinker House is concrete pavers on a sand base and reclaimed bricks on the edges. You can see how high the flood waters got by the skirt on my workbench! I seem to use a lot of twine and jute so I keep larger spools of it out here! The darling Eiffel tower scissors were a gift from a dear friend! Thank you Lynne! There is still a little loft above this side but these days...I only store a few extra pots! It's just too high for me to get to ! Yes, those are vintage doorknobs and locks sets on the roof! Some even have the keys wired to them! 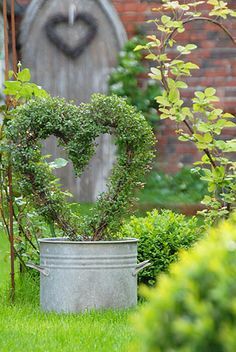 Just for fun~ A tiny touch of whimsy that the birds appreciate! Autumn will be here before you know it and the Sweet Autumn Clematis will be in bloom on the roof ...I can't wait to see it! I have sheets to take off the line and carry to my new laundry room! It's almost complete and I look forward to sharing it with you along with a settee project I've started! Yep...always something going on here at our house! Even Emmitt seems to get involved! I am so excited about being a part of the most amazing event taking place this October! This will be my first time to just be a vendor no event production tasks. Both of these talented ladies will have spaces there as well! For more information, follow this link to there facebook page! I'm off to fold linens! I so enjoy looking at photos of your darling little Tinker House and I know what you mean about doing nothing but yard work and still have a ton to do. It's never ending, but I've actually done more this year around our property than the last three years combined, just do to lack of time and this Summer I decided I was going to MAKE time...feels good! PS: I love all your boxwoods and wished I would have planted hundreds of them around years ago. They are so timeless! As always, your attention to the tiniest of details is hard to beat. Your precious creation is probably the most pinned house in the history of ever. I may be seeing you in October if all goes well and the creek don't rise. 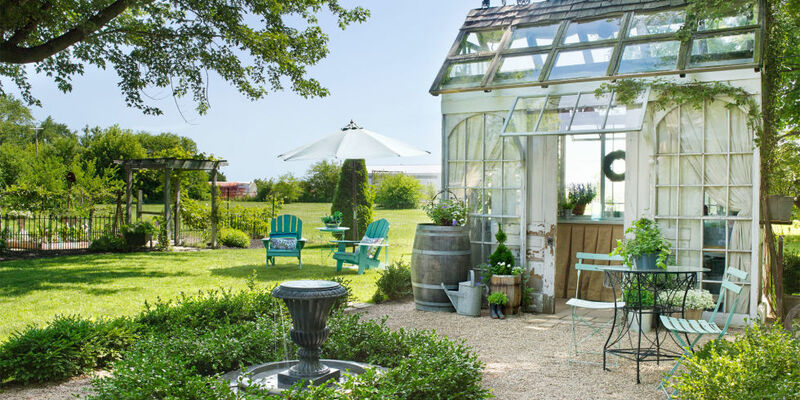 I am completely obsessed with your potting shed and I would garden just to get to escape there! Love the arched windows, the climbing vines, the crushed pebbles...charm personified!! Tinker House is always so lovely! I never tire of looking at her. She is a grand beauty!! It's such a beautiful little sanctuary! I love every detail. And I love the shot of your sheets on the line! Lovely and so serene. I can imagine what comes out of Tinker House is just as lovely. Your garden house is just beautiful! Love all the vintage loveliness and that you were able to repurpose things from your own home for it. Hey beautiful girl! I have missed you so much but I think we are always in each other's hearts. I'm a bad, bad communicator :)))) I love seeing Tinker! I had forgotten how bad the flood was until you reminded me with the photo. Wow...that's a ton of water. I loved seeing the photos of you, Rebecca and TOT. I love you girls!!! Everyone needs a tinker house. I know I do! I can never tire of seeing yours. Thanks for sharing it with us. So glad that Tinker House survived the flood! I pinned another one of the pictures of it with the circular boxwood/fountain in front. Everything looks so green right now. 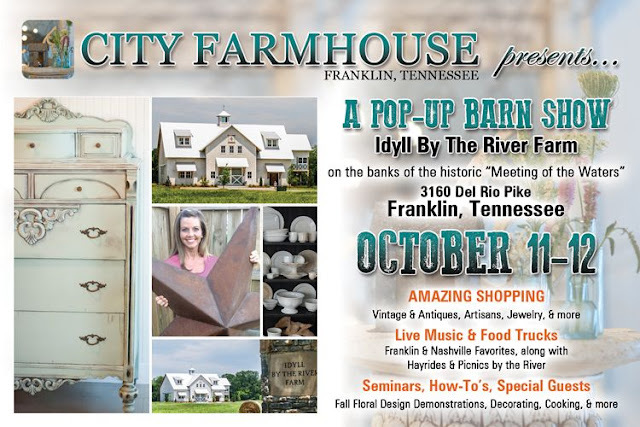 I would love to be in Franklin,TN with you on Oct. 11-12, but probably will not make it. :( Franklin is just a lovely little town with so many great antique stores. I am so happy to have found your blog through TOT, who I adore. Your little space is truly amazing and embodies everything that I miss about the US. France is wonderful and I love it here, but I MISS the creativity and inspiration that comes from home.